The United States dropped over 2.75 million tons of bombs in Cambodia between 1963 and 1975. Intended to attack the North Vietnamese troops along the border, more tons than all bombs used by the Allies in WWII, including the nuclear bombs used in Hiroshima and Nagasaki. The bombing started under Lyndon Johnson and was continued and increased by Nixon, who was decieving the American public about the situation in Southeast Asia. This information was only revealed in 2000 when President Clinton gave Cambodia the Air Force data to help assist with locating the unexploded ordinance that now litters the country and still devastates families more than three decades after the fact. This bombing instead of killing the Vietnamese Communists and halting the Ho Chi Minh Trail, just drove them further into Cambodia. It also helped the Khmer Rouge to recruit villagers by uniting them against the American bombing and killing. Innocent people were dying, their villages being blown up, their rice fields and other farms destroyed. Where else could they turn? The Khmer Rouge came to power in 1975 when the US backed government was overthrown and the four-year reign of terror began. Have we learned from our mistakes? Have we stopped bombing the innocent to get to the enemy? 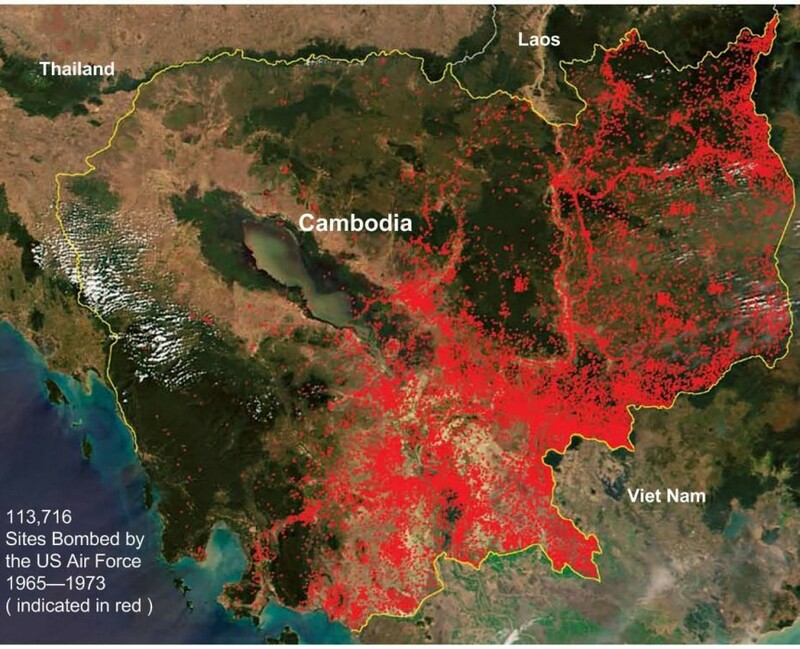 Between bombs, land mines, genocide and the continued fighting of the Khmer Rouge from the jungle until 1998, Cambodia had been in a state of war for 40 years. Today, over 50% of Cambodia’s population is under 18. How does a country of scarred adults and children, many orphaned, poor or permantly injured from the war’s leftovers, rebuild itself? Tourism is helping and Japan and Korea are pouring in investment money. There are NGOs like Sak Saum changing the country by investing in individuals. But is it enough? The Cambodian people are beautiful and resilient but the devastation has been great and I fear it’s a long road to full recovery.